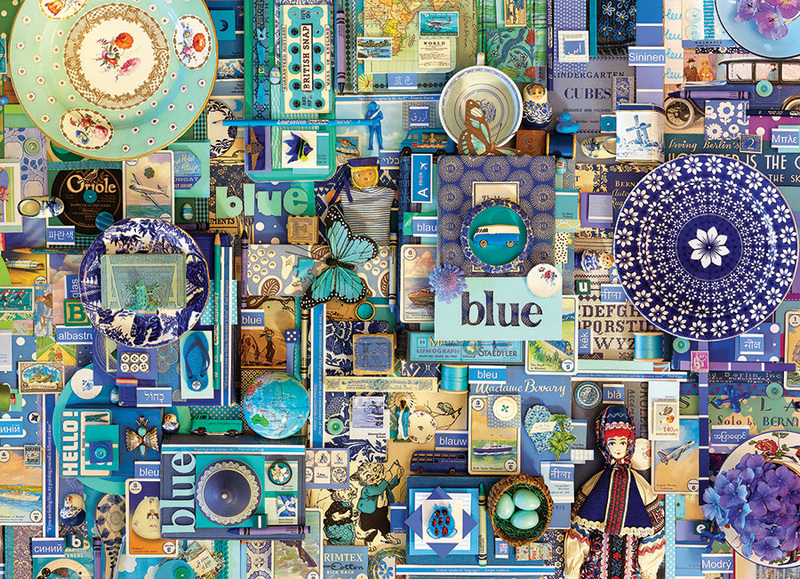 This special 1000 piece puzzle by artist Shelley Davies celebrates all things Blue. It's one in a series of seven puzzles that make up a rainbow theme when all are completed and aligned next to each other, spanning 15.5 feet. Ribbons of the word, "blue" are spelled out in multiple languages, along with vintage knick knacks and a pencil with the artist's name on it. Roses are red, violets are blue..this could be a good Valentine's or Easter puzzle too. The Rainbow Collection is a unique puzzle designed and photographed exclusively for Cobble Hill in Victoria, BC. Item # 80150 Weight 1.61 lbs.